The valley is part of Monument Valley Navajo Tribal Park, a Navajo Nation equivalent to a national park. The entire area is located within the Navajo Indian Reservation near the town of Goulding, originally established in 1923 as a trading post. The Monument Valley has been the site to a number of films and television shows since the 1930s and for some time defined what people thought of when they pictured the American West. Visitors to the valley have a good option of ways to experience the area, all of which are made more memorable by the stunning surrounding vistas. Go for a scenic drive along the 17-mile dirt road, schedule a Jeep tour guided by local Navajo, go for a ride on horseback or get a bird’s-eye view from a hot air balloon. Certain areas offer camping, hiking, hunting, and fishing, and restaurants and museums aren’t far from the park. Deep in the heart of the American Southwest, Goulding's Lodge offers Monument Valley lodging with unprecedented amenities, along with providing unique expeditions enabling the guest to search out the mystery and wonder that is the Navajo land. At the View Hotel, the ancient and the contemporary meet you each morning. 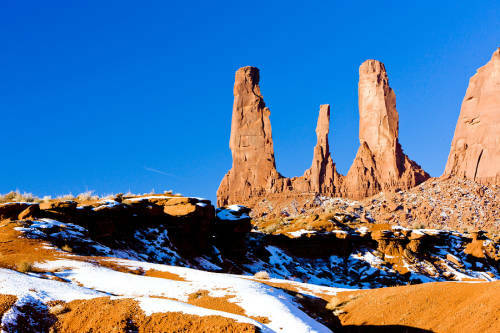 As you look from your View Hotel guestroom the iconic formations of the world famous Mittens stand before you in timeless beauty.